Lets get the hardware out of the way. The Intel Compute Stick is a full computer in a form factor that looks like a large USB memory stick, but instead of plugging it into a USB port, it plugs into a TVs HDMI port. Obviously for around $130 on Amazon it isn’t going to have massive specs, but it isn’t completely unusable. There are two version, one with Ubuntu Linux and another with 32 bit Windows 8.1 with Bing. The Linux version has 1Gb of ram and 8Gb of storage while the Windows version sports 2Gb of ram and 32Gb of storage. The Linux version can be found for $20 to $30 less than the Windows version, but the lighter specs of Linux version doesn’t have the resources needed for Windows. Intel only supports Ubuntu 14.04, other Linux variants may work, but they’re not officially supported. Of course from what I’ve read on the Intel support forum, there really isn’t much in the way of support for any kind of out of the box tinkering. 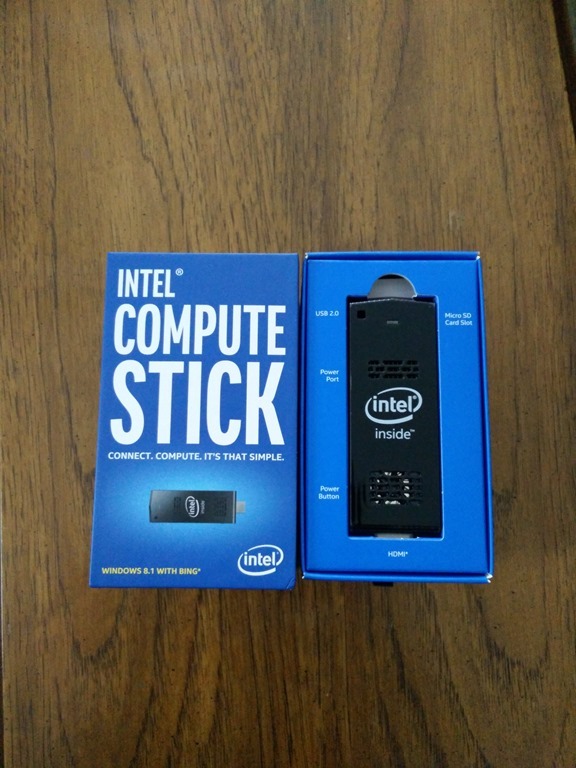 Both versions have an Atom Z3735F CPU (1.33 Ghz Quad core), Intel HD graphics, a Micro SD card slot, a USB 2.0 port, WIFI (B, G, and N), and Bluetooth 4.0 support. 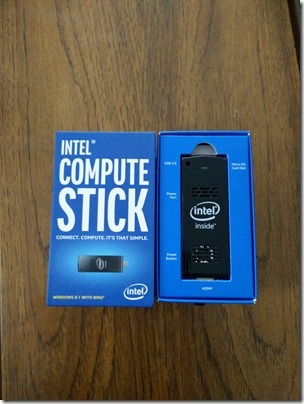 The Compute Stick is powered by what is basically a 2 amp cell phone charger using a micro-USB cable and the stick will start booting as soon as you plug it in. There is also a single power button on the side of the stick so you don’t need to mess with the power cable if you had shutdown the stick and want to start it back up. Intel also has drivers and mobile apps that can allow a person to use an Android or iOS device as keyboard and mouse. As soon as I got the stick I poked around the UEFI configuration. There are really only two settings that need to be explored. The first is a OS switch to pick Ubuntu or 32bit Windows. The second is a performance setting. The performance setting has three options. 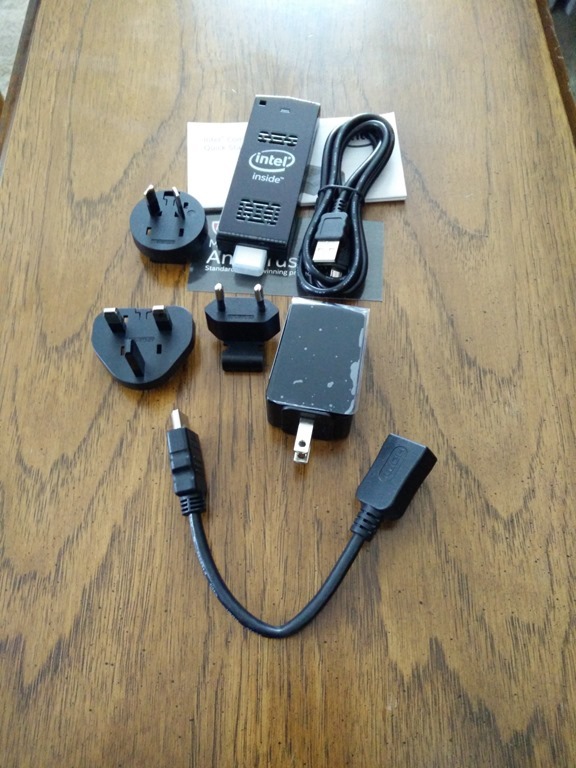 The low power and normal display a warning that it can drive up to 4 USB devices on a unpowered hub or 8 with a powered hub. The high performance power option warns that it can only support one attached USB device or more with a powered hub. I’ve tried all three options and didn’t see any noticeable difference in performance or with the power draw on a kill-a-watt, generally 0.6 amps, but I’m running all of the USB devices on the powered hub. Before I started to do anything else with the Compute Stick, I setup a USB boot drive with Ubuntu 14.04 and changed the UEFI OS setting to Ubuntu. I booted Ubuntu from the USB and used a built in command to create an image copy of the internal storage. I did this because Intel is not being very supportive of people who want to reinstall to a factory state. I did have issues creating the Ubuntu boot drive and I can go through the details on that if there is interest. I then switched the OS setting back to windows and and started using Windows 8.1. I installed Kodi media center and and copied a few 1080p MP4 movie files onto the stick. I then went ahead an upgraded the stick to Windows 10. I needed to insert a micro SD-card so Windows Update had room to download the install file. I started the upgrade about 6pm one evening and it was still running the next morning. It was finished by the time I got home from work that evening. Other than the upgrade going slowly, it did complete with out any problems. I did need to download and install Window 10 drivers from Intel to get full use of some features. I’ve also setup a Bluetooth keyboard with the stick and it has been working fine, though I really need to test a Bluetooth mouse. Mice show Bluetooth issues faster than a keyboard does. 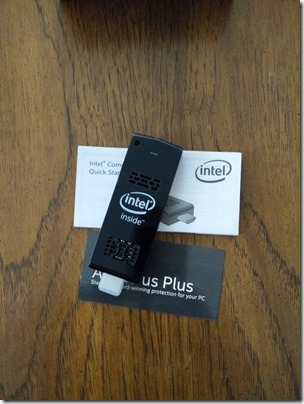 I’ve setup the Intel Remote Keyboard app on my phone and it also works very well. It provides keyboard and mouse control from a phone or tablet over WIFI. 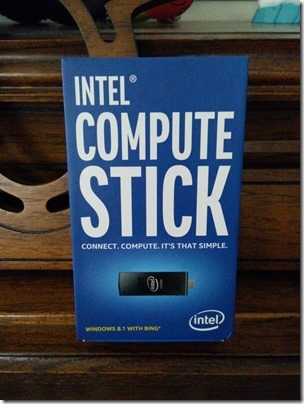 Why did I want a Compute Stick? 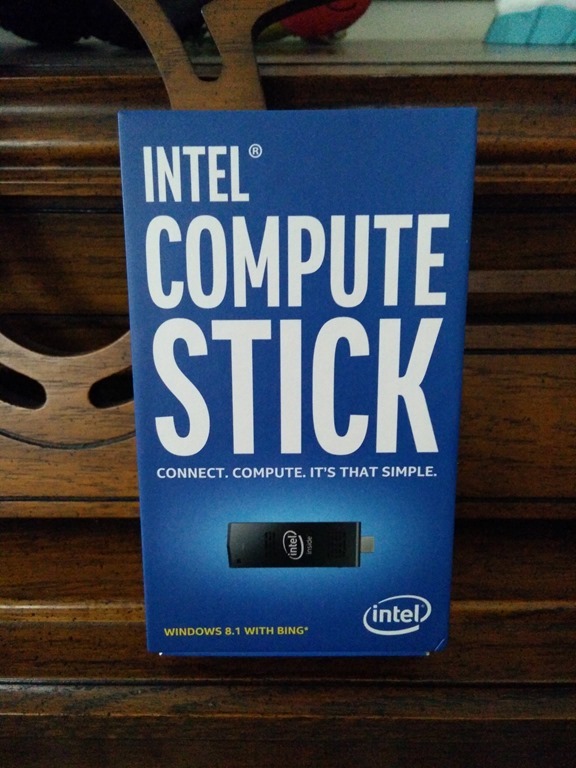 Before I got the stick I thought there were three things that the Compute Stick might be good at. Network Storage or Very low power home server. Now before you say why use a $130 stick in place of a $40 pi. Raspberry PI aren’t that cheap once your done nickel and dimming the other thing you need. So it’s not much difference. I know the stick doesn’t have the GPIO pins, but that can be added, though it changes the price balance a little bit too. But I think the Compute Stick is still an viable option. To “make” something with the Compute Stick as the brain in stead of a Raspberry Pi. The CPU is adequate for light use without loads of multitasking. Web surfing is ok, but I’m not opening loads of tabs and I’m not running Chrome which is a resource hog. The internal storage is slow and the WIFI is rated for up to N, but I haven’t been seeing good speeds, but I think the proximity to the TV maybe a contributing factor. It will play back on-board 1080p MP4 videos with out half trying. Kodi with the HDHomerun plug-in connects to my networked TV tuners and plays HD TV shows with little to no issues. I did have issues with high def video streamed from YouTube, but that seams to be tied to the WIFI problems because they cleared up when I connected a USB Ethernet adapter. I also tried a USB N WIFI dongle to the hub which placed it further away from the TV and I got good throughput and watched high def video off of amazon and had no buffering or breakup issues. I need to find a longer HDMI cable to move the Compute Stick further away from the TV to see if that solves the WIFI bandwidth problem.